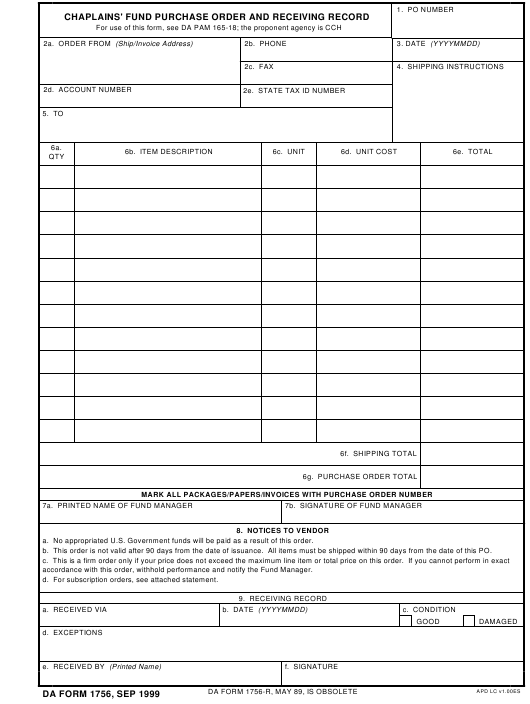 DA Form 1756 - also known as the "Chaplains' Fund Purchase Order And Receiving Record" - is a Military form issued and used by the United States Department of the Army. The form - often mistakenly referred to as the DD form 1756 - was last revised on September 1, 1999. Download an up-to-date fillable PDF version of the DA 1756 below or request a copy through the chain of command. a. No appropriated U.S. Government funds will be paid as a result of this order. b. This order is not valid after 90 days from the date of issuance. All items must be shipped within 90 days from the date of this PO. accordance with this order, withhold performance and notify the Fund Manager. d. For subscription orders, see attached statement.